What's In My Summer Makeup Bag? 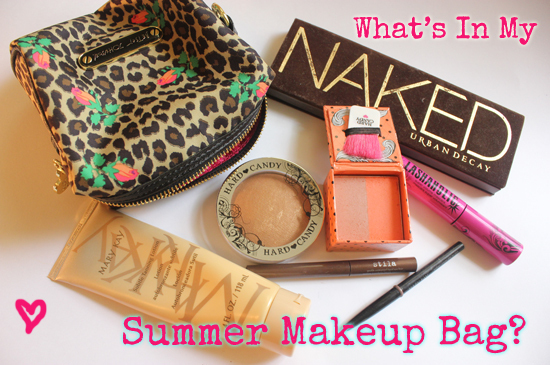 What’s In My Summer Makeup Bag? Summer always leads to a shake-up in my skin care routine and makeup choices. Not only does my face get more oily, and the rest of me gets really dry from the sun, the colors and application of my daily makeup changes as well. My signature Apple Berry lipstick doesn’t work as often during the summer, when I trade in my dramatic liners and smoky eye looks for something a bit more natural & versatile- as you get more sun after a long winter your skin care and your coloring needs to make some adjustments! Not only do I swap out my deep colors for the lighter shades, but I like to try new brands when the seasons change. 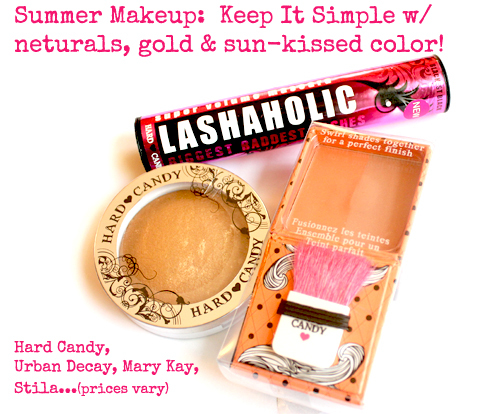 This summer, I’m giving Hard Candy a try. I wiped out my last mascara- so I am trying Hard Candy’s Lashaholic black mascara- and loved the applicator, it’s very flexible. I also gave the bronzer a try (perfect) and the cheek color (while a bit too orange for me) comes in the cutest box. I love experimenting with new brands! I also swap out my signature black liquid eyeliner for a more neutral look- this year, I’m trying Stila’s Sparkle Waterproof Liquid Eyeliner in Rock Candy (brown) paired with the Mary Kay eyeliner in Taupe. Before I head out for the day- I always try to exfoliate and moisturize so my skin doesn’t look dull or ashy. I’m in love with sugar scrubs. This Walnut Sugar Scrub from Bella Il Fiore (I’ve reviewed their stuff previously here) smells of peppermint and is perfect to prep your feet as we enjoy sandal season! I have such dry skin, I love to moisturize and exfoliate all in one step if I can help it… I’m obsessed with scrubs. Of course, sun protection is key- I use SPF 30 (or higher) whenever I go to catch some sun. Ladies, do NOT SKIP ON THE SUNSCREEN I know it seems like a hassle…but just throw some sunscreen in your tote! My dry skin annoys me… amplify that with sun exposure, water and warm temperatures. Coconut oil is by far the BEST moisturizer out there. 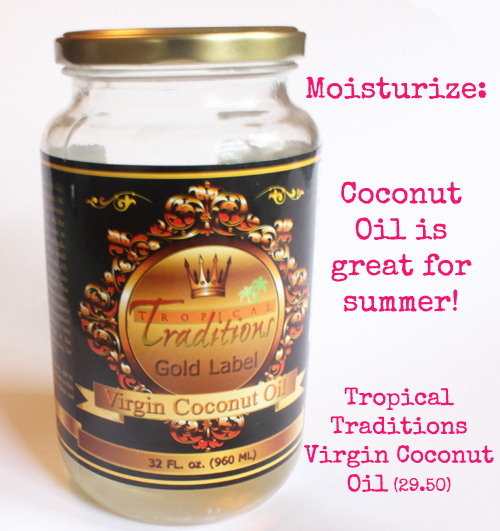 I’ve tried natural oils for years- olive oil, cocoa butter and a few others, but in my experience, coconut oil is the best for summer moisturization. Coconut oil is perfect for summer body care for two reasons: it smells heavenly for summer without overpowering perfume, plus it’s light enough to absorb quickly and doesn’t get greasy when applied. I get a big jar of virgin coconut oil from Tropical Traditions (I actually had a giveaway a few months back) and half I use for cooking, the other half I put in a cute tupper for the bathroom. For about $30 you get a lot! Betsey Johnson and I were in the same sorority (I say that like we actually knew each other..haha, but love you Alpha Xis!) and I adore her style. I upgraded my makeup bag for the new season- to house my summer selections. I fell in love with this Betsey Johnson Makeup Bag from LA Style Rush to house my summer makeup & sunscreen for on-the-go touchups. 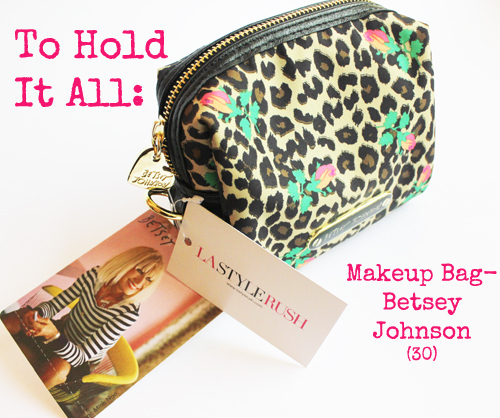 Oh, of course you’d love a Betsey Johnson Makeup Bag, wouldn’t you? Well wouldn’t ya know- LA Style Rush is giving away $25 to spend at their shop (to buy this bag I’d assume? YES!) to one lucky reader! Head over to BeautifulGiveaways.com to enter! So, what’s in your summer makeup bag? Love the bag & love Betsey! Thanks for the chance to win. I came over from beautiful giveaways website. I really like the items you picked for summer. I need to change my makeup out too because the colors look wrong on me since I’ve been in the sun more. Ya, it’s easy to get “mime face” when you skin gets darker and your makeup doesn’t match! I not only change out my foundation but the lipsticks and coordinating colors. Thanks for stopping by! Isn’t she fabulous??! I am such an ardent fan of her crazy designs, they just make me happy! I’m a fan of hard candy stuff, and that bag is adorable. Can I get an amen?! AMEN! I may have to try the Naked palate – I’ve heard such good things about it and it looks perfect for summer. OH yes, I heard so many things about it I finally gave in and had to get it! It is pricey but a great and versatile palette…the primer that comes with it is really great! I’m never without sunscreen in the summer — especially for my face. smart move, sistah! I need to be diligent…my Canadian skin needs to be protected! Oh totally- coconut oil is so light and perfect to hydrate the skin during summer…plus it smells so delish for a warm day. I have been really curious to try out Hard Candy. A few months ago, there was a Still eyeliner in my monthly Birch Box and I am hooked. It’s a gorgeous peacock color that I never would have tried on my own. Oh ya- I never would have tried a blue eyeliner..but after I got the Stila rock candy glitter liner I went back to Birchbox and got it in peacock blue and sapphire as well, so much fun to experiment with! My summer bag includes lots of glittery nail polish and Stila illuminating tinted moisturizer with SPF 15. I LOVE glittery nail polish..it’s a pain to remove but so fun to layer! Love that makeup bag! As well as Betsy! What a fantastic makeup bag. I love it and love the coconut oi. I absolutely love Betsey Johnson’s stuff too. I’m so sad her company had to file bankruptcy and is going out of business. 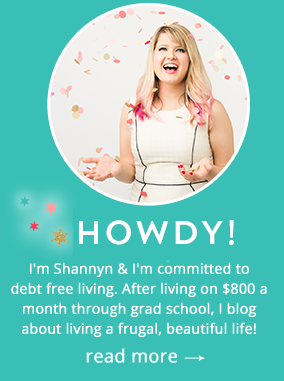 It makes me wonder if her products, that I already own, will be worth more now – Ha! I need to buy myself some bronzer for the summer, and spice up my summer make up bag. I bought some exfoliating scrub and it’s amazing. Normally I only exfoliate consistently throughout the winter when my skin is really dry, but I’ve been doing it more during the warm weather too. Coconut oil is my lifesaver. I use it for both cooking (I haven’t used cooking oil or butter in months) and as a moisturizer/massage oil. I’d say it’s my “must-have” beauty product!